In last week’s article, we looked at nine classic prize fights that were contested at well known outdoor stadiums. In Chicago, it was Soldier Field and Comiskey Park; in New York, the Polo Grounds and Ebbets Field; and in Washington D.C., Griffith Stadium. This week, the spotlight will be on “The House that Ruth Built”, the legendary Yankee Stadium. Though the Bambino and his famous baseball teams were the star attraction at this venue, and the New York Giants football team was the gridiron tenant (1956-73), the sport of boxing brought in big names and big crowds, as well. It was said that Yankee Stadium was Joe Louis’ personal fight club as he appeared there so many times (twelve times per BoxRec). 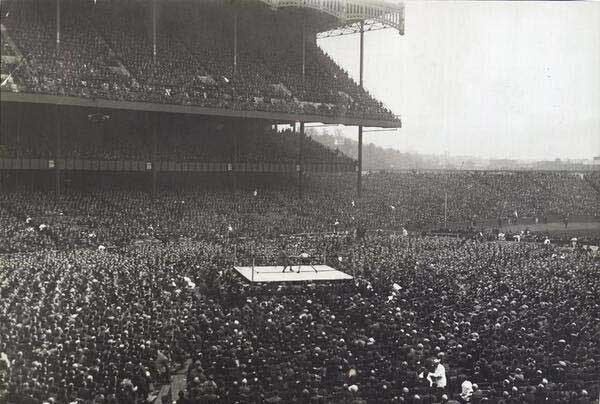 The stadium was actually prepared for the fight game as a concrete vault with radio lines permanently installed for broadcasters was buried in the ground under second base. Jess Willard defeated Floyd Johnson by technical knockout in round eleven on May 12, 1923. In the first boxing event ever held at Yankee Stadium, promoter Tex Rickard organized a benefit program staged as a heavyweight carnival from which a worthy challenger for champion Jack Dempsey could be selected. The 6’ 6” Willard who was 41 and not active at the time was brought in to face the young Johnson who was 38-2. Willard trained hard and was good for a few rounds, pounding Johnson with uppercuts until the younger fighter took control. Somehow, Willard made it to the eleventh and caught Johnson with a huge punch to end the round, and Johnson couldn’t answer the bell for round twelve. 63,000 were there to see it. 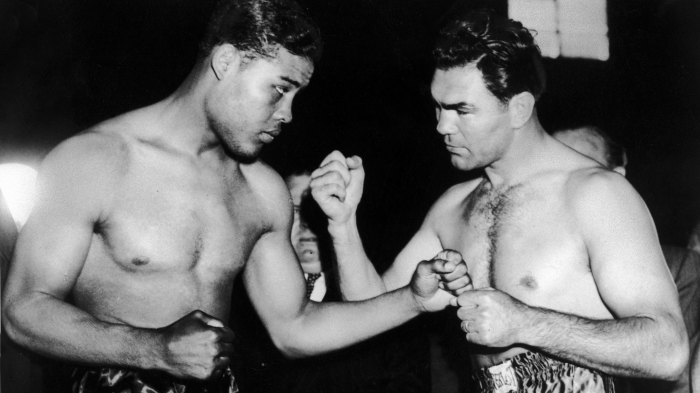 Max Schmeling defeated Joe Louis by knockout in round twelve on June 12, 1936. The experienced Schmeling (59 pro bouts) used timing and counter-punching to conquer the young and powerful Louis, sending him down with a big right hand before an estimated 60,000. Louis would later get a title shot, defeating Jim Braddock in 1937. Joe Louis defeated Max Schmeling by knockout in the first round on June 22, 1938. In their much anticipated rematch, Louis pounded Schmeling in front of a sell-out crowd, knocking him down three times in 56 seconds. The third time, the German’s corner threw in the towel as the referee continued the count, and Schmeling could not get up. Joe Louis defeated Billy Conn by knockout in round eight on June 19, 1946. This was the rematch after Louis’ win at the Polo Grounds. Due to military service, neither man had fought (except for exhibitions) in over four years. It wasn’t near the contest as was the first match, and Louis ended the evening with a right upper cut and a left hook putting Conn down for the count. However, the bout is famous as it was the first world heavyweight title fight broadcast on television (by NBC). Tony Zale defeated Rocky Graziano by knockout in round six on September 27, 1946. This World Middleweight title fight was the first of their three meetings. Zale looked beaten after five rounds, but a right to the body and a left to the chin put Graziano down for the ten-count. 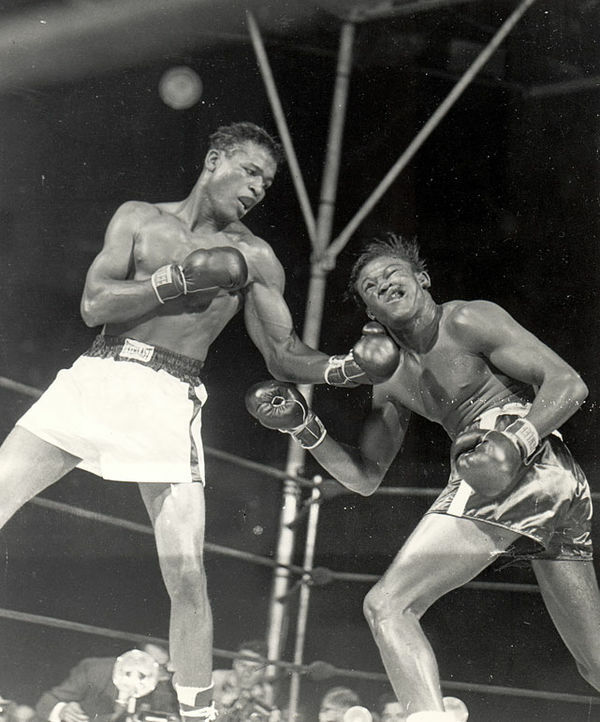 Sugar Ray Robinson defeated Kid Gavilan in a ten round unanimous decision on September 23, 1948. This was a bout on the undercard of the Ike Williams vs. Jesse Flores World Lightweight championship fight. Robinson forfeited $5,000 as he was one half-pound over the contracted weight of 150. Sandy Saddler defeated Willie Pep by technical knockout in round seven on September 8, 1950. Pep was ahead on all cards, but retired with a separated shoulder and Saddler took the World Featherweight crown. This was the third of their four bouts. Rocky Marciano defeated Ezzard Charles by unanimous decision on June 17, 1954. Marciano defended his heavyweight title over the former champ Charles before 47,000 fans. Despite a cut over his left eye, Marciano went 15 rounds for the first time in beating Charles. 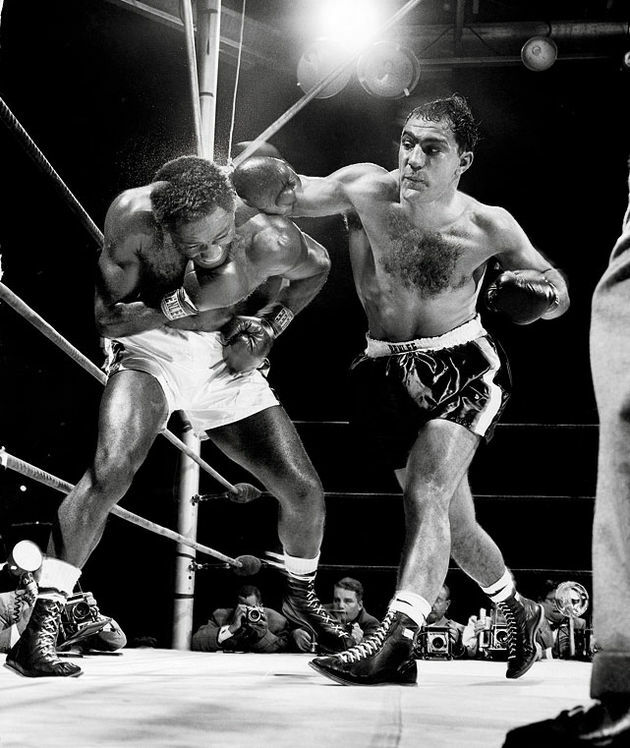 Rocky Marciano defeated Ezzard Charles by knockout in round eight on September 17, 1954. In their second meeting, the champion “Brockton Rock” earned his 47th win and 41st KO. Marciano dropped the “Cincinnati Cobra” for a four-count, then finished things with a left hook and a right cross to the jaw. Rocky Marciano defeated Archie Moore by knockout in round nine on September 21, 1955. After going down once, Marciano took care of the Light Heavyweight champ, dropping him three times before ending it in the 9th. It was Marciano’s final fight; he is still the only heavyweight champ to retire without a loss (49-0 with 43 KOs). Carmen Basilio defeated Sugar Ray Robinson by split decision on September 23, 1957. After coming out of a short retirement, Robinson won the middleweight title from Bobo Olson. Basilio, the welterweight champ, moved up to challenge Sugar Ray and was victorious. Robinson would win back the title in their rematch six months later in the “Fight of the Year”. Ingemar Johansson defeated Floyd Patterson by technical knockout in round three. The big Swede was the #1 contender with a big right hand that was nicknamed “The Hammer of Thor”. In the 3rd round, that hammer put the champ down. He got up, only to be pummeled by Johansson, who dropped Patterson five more times before the referee stopped the fight, giving Johansson the crown. Muhammad Ali defeated Ken Norton by unanimous decision on September 28, 1978. 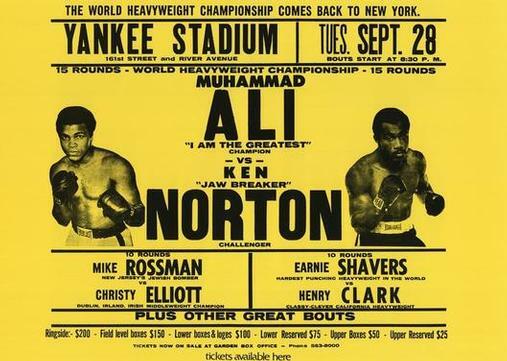 This was the third meeting between them, with Norton winning the first and Ali the second. Ali had regained the heavyweight crown, and this fight went the distance. Many felt there was no clear winner, but Ali retained his title on all cards. It was to be the last prize fight held in “The House that Ruth Built”. I hope that you have enjoyed this look at the outdoor portion of the boxing world. The indoor gyms and fight clubs are truly nostalgic venues, to be sure. However, many outstanding and historic bouts took place in the open air arenas, and it is always enjoyable to take a walk down memory lane wherever classic fights are held. Without a doubt! HANDS DOWN! My favorite article EVER from dmboxing.com! I have always loved the older stadiums, since as an 8 year old, I climbed the ramp at the old Cleveland Municipal Stadium and saw that vast verdant field and the red and gold rows of seats, as well as the deep blue of the bleachers and the Marlboro scoreboard! (This was 74…the stadium was more often than not nowhere near its capacity of 80,000. I saw games with less than 8,000., there. Thanks for another piece of supreme fistic journalism! I love the article and the classic pics.